"4th 20" is the results for Games 61-80 for each team. 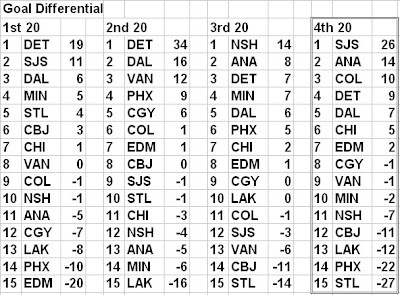 Goal differentials are derived from the standings pages, i.e. they include the shootout goal. I've been tracking quarterly results since the lockout, and the best any team has previously done in one of these 20-game segments is 35 points. For San Jose -- you know, the Flames' presumptive 1st-round playoff opponent -- to earn 38/40 points is a spectacular achievement. Also, the results say that Ottawa is way past the point of if they could just find their mojo again... the results say that Ottawa is a bad team. Ottawa's so bad, you seem to have labelled them as the second coming of the Tampa Bay Lighting -- literally -- in your GD chart. Washington's interesting to look at too, b/c of the meteoric rise in GD in this last quarter. Accompanied by slight rise in points. What's the greatest/worse goal differential recorded in a single quarter, since you started tracking? Worst GD (surprise! ): Oilers, 4th 20 of last season, -39. Their 7 points in that quarter is also the record low. Imitationis the biggest form of flattery. Your quarterly review all year had me waiting for the end of the year. I recreated your table structure(in Excel)and point totals to review the year trends. 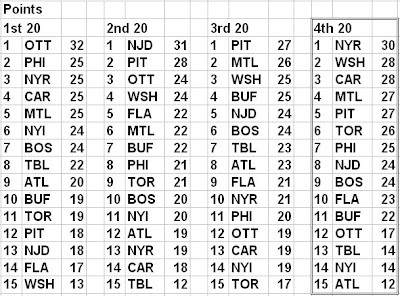 I looked at the first 60GM; last 60GM; First 40GM; Middle 40GM; last 40GM. I think the trending would be interesting to the readers. Your quarterly review is a great idea. The first quarter of the Oilers season in terms of goal differential makes me cry. The second, third and fourth quarters make me feel a lot better about the kids. The light went on somewhere around when Raffi went down. Coincidence? These stats may help drive home a point that I've been trying to make with friends for the past several weeks that everyone is beating up on each other. Goin in, the Sharks are in a class by themselves, but everyone else is closely matched. Stresses the fact that we need 6th place!! Matt, there's one other chart that you may want to revisit from last year. You did a playoff teams head-to head goal differential that showed Anaheim about plus 30 and every other team in the west nowhere. This year's numbers would be interesting to see (hint, hint). 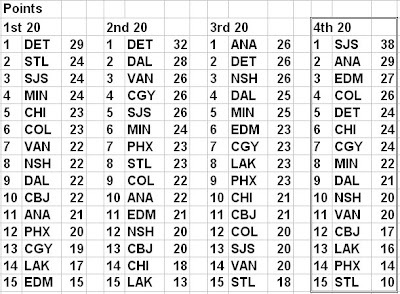 Interesting to see the steady rise in the ranking for Edmonton in points from one quarter to the next. 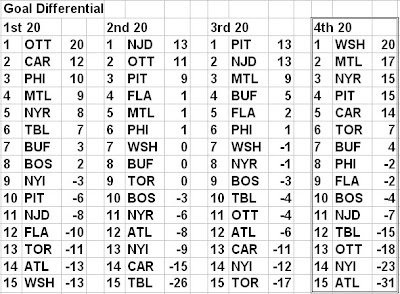 And Ottawa looks like a completely different team in the two halves of the season.